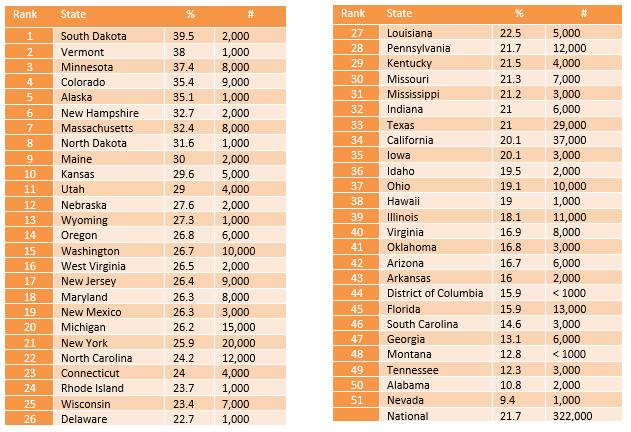 States with high rankings have lower prevalence of mental illness and higher rates of access to care for youth. Lower rankings indicate that youth have higher prevalence of mental illness and lower rates of access to care. Students Identified with Emotional Disturbance for an Individualized Education Program. 11.01% of youth (age 12-17) report suffering from at least one major depressive episode (MDE) in the past year. Major Depression is marked by significant and pervasive feelings of sadness that are associated with suicidal thoughts and impair a young person’s ability to concentrate or engage in normal activities. Data indicate a significant increase in the number of depressed youth across the county over time. The state prevalence of youth with MDE ranges from Washington, DC at 8.69% to Oregon at 14.62%. 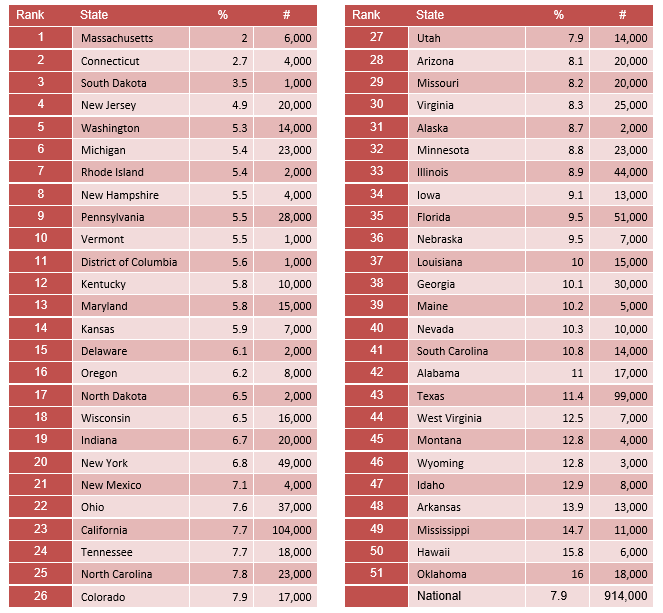 States with highest rates (bottom 10 states) have almost TWICE as many severely depressed youth than states with the lowest rates (top 10 states). The state prevalence of youth with Severe MDE ranges from 5.2% in North Dakota to 10.7% in Oregon. 5.13% of youth in America report having a substance use or alcohol problem. Substance use are going down throughout the country over time. The state prevalence of youth alcohol and substance use ranges from 4.06% in Oklahoma to 6.44% in Colorado. 64.1% of youth with major depression do not receive any mental health treatment. That means that 6 out of 10 young people who have depression and who are most at risk of suicidal thoughts, difficulty in school, and difficulty in relationships with others do not get the treatment needed to support them. 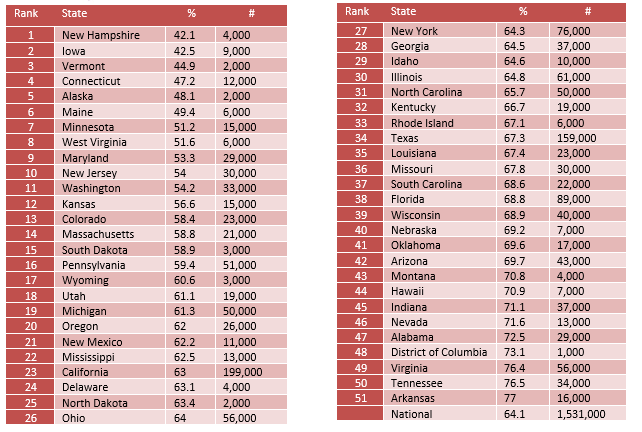 The state prevalence of untreated youth with depression ranges from 42.1% in New Hampshire to 77.0% in Arkansas. Nationally, only 21.7% of youth with severe depression receive some consistent treatment (7-25+ visits in a year). Even among youth with severe major depression, 62.6% did not receive any mental health treatment. The state prevalence of youth with severe depression who received some outpatient treatment ranges from 39.5% in South Dakota to 9.4% in Nevada. Children and youth are more likely to have insurance coverage compared to adults. 7.9% of youth had private health insurance that did not cover mental or emotional problems. Kansas, Louisiana, Arizona, and South Carolina saw the largest increase in access to mental health coverage among children. Like adults, having insurance coverage does not mean access needed treatment. 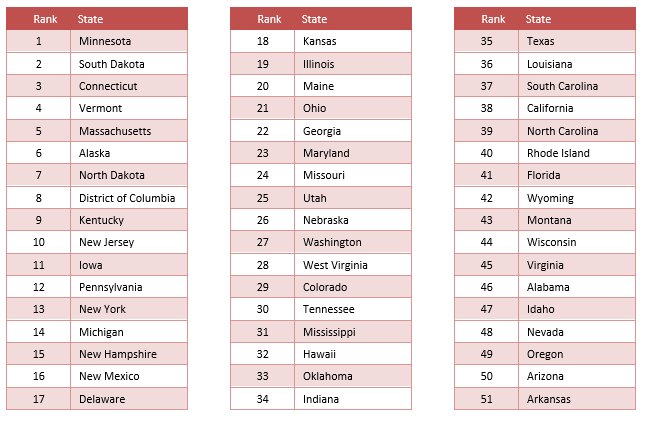 The state prevalence of children lacking mental health coverage ranges from 2.0% in Massachusetts to 16.0% in Oklahoma. .771% of students are identified as having an Emotional Disturbance (ED) for an Individualized Education Program (IEP). The term “Emotional Disturbance” is used to define youth with a mental illness for purposes of an IEP. Often times youth with emotional or mental health problems are identified as having other issues rather than an emotional or mental health problem. In such cases, it is unclear whether their mental health problems are taken into consideration in planning for appropriate educational modifications and accommodations in their IEP. The rate for this measure is shown as a rate per 1,000 students. The calculation was made this way for ease of reading. Unfortunately, doing so hides the fact that the percentages are significantly lower. If states were doing a better job of identifying whether youth had emotional difficulties that could be better supported through an IEP – the rates would be closer to 8% instead of .8 percent. 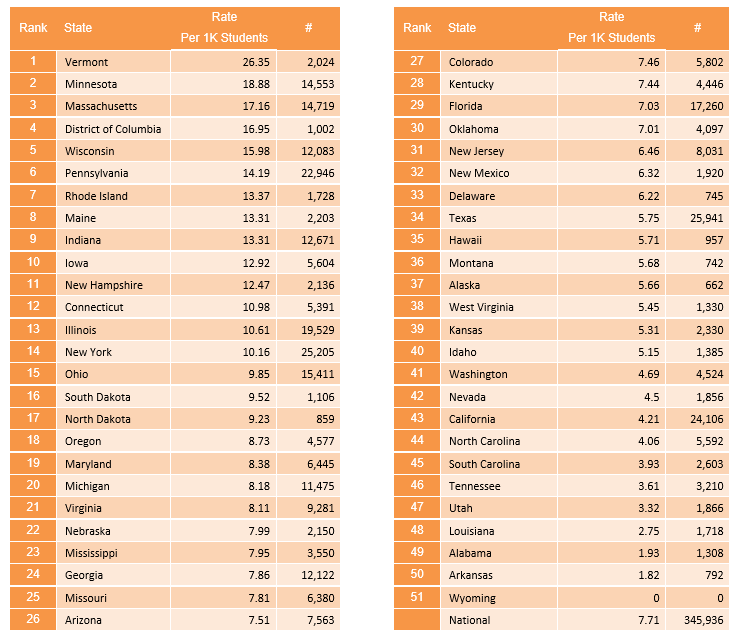 The state rate of students identified as having an emotional disturbance for and IEP ranges from 26.35 per 1,000 students in Vermont to 1.82 per 1,000 students in Arkansas.